Earlier this year you might have seen me on Instagram, hunkered down with my headphones and snazzy thunderbolt socks, conducting interviews for a big project I had in the works. 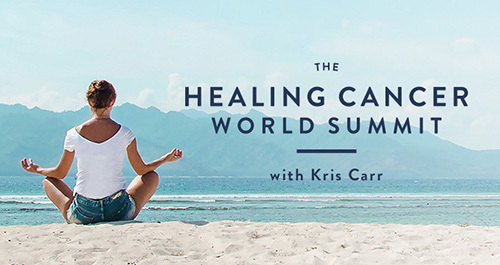 That project—the Healing Cancer World Summit—has now concluded, but you can still join the waitlist for the next summit (and get a free gift while you’re at it). Sign up here! The Summit included some of the leading wellness experts, mind-body practitioners, integrative MDs and oncologists in the world—all of whom I hand-picked and interviewed myself. And let me tell ya, I learned a lot! 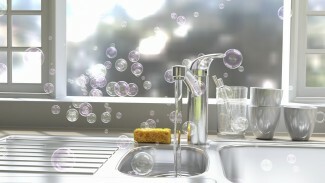 Not only about cancer and how I can take my own healing practice up a notch, but also about prevention. I’m passionate about helping cancer patients heal and about prevention, and I think you are, too. That’s why you’re gonna love today’s interview. It’s packed with incredible information! But before we dive in, I want to share something very personal with you. Hay House has been asking me to lead this Summit for years and until recently I’d always turned them down. Why? I guess because I live with cancer, I just didn’t really want to spend an entire year of my life talking about it. But then everything changed when one of my very close family members was diagnosed with an aggressive cancer that turned our world upside down. I haven’t talked about this publicly yet, but I will. Anyway, this person who I love dearly is now in remission and doing better each day—thank God! And our experience is what helped me realize that I had to do the Summit. Because what my family and I learned years before as a result of my own diagnosis is part of the reason we were able to make a powerful healing gameplan so quickly. And because I have access to some of the leading minds in integrative medicine, it would actually be a disservice not to share. Which brings me to today’s interview. Chris Wark is one of the inspiring speakers in the Summit and if you haven’t heard his story and advice, you’re in for something special and important. And yes, we wear matching outfits and have a lot of fun, too. Humor heals, after all. Two days before Christmas, when Chris was just 26 years old, he was diagnosed with Stage 3 colon cancer. He immediately had surgery to remove a golf ball-sized tumor and a third of his colon. 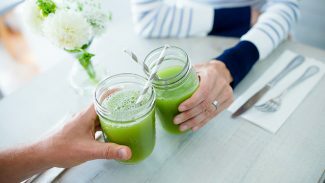 But after surgery, instead of the traditional chemotherapy, Chris decided to radically change his diet and lifestyle in order to promote health and healing in his body. 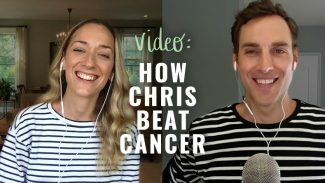 Find out how @chrisbeatcancer radically changed his diet and lifestyle to promote health and healing—and what you can learn from his journey. Chris is still cancer-free today and he’s here to share the strategies he used to help heal. These strategies include radical diet (hello plants!) and lifestyle changes, a healing mindset, and mental, emotional, and spiritual healing, as well as advanced integrative therapies. Just a heads-up that this is a long interview. And in the age of social media and sound bites, it’s easy to want to rush through content. But this is a full meal, so I encourage you to make time to watch it, because it’s packed with crucial tips that you or someone you love may need. Press play below to join our conversation! Here’s something to keep in mind: There’s no one-size-fits-all approach to healing. Even though I wasn’t a candidate for treatment because of the type of cancer I have (my disease is slow-growing and stable, plus there really aren’t any treatment or surgery options for me), and Chris had surgery but decided against the recommended chemotherapy—that doesn’t mean that I’m suggesting that patients use only natural therapies. I’m a proponent of whatever works for YOU, and whatever it takes to heal. In fact, in many cases a well-guided combined approach (conventional and integrative) may be the best way to stack the odds in a patient’s favor. Above all, remember this, you can’t outsource your health to anyone! You are the CEO of your well-being. And as the CEO, you need to run the show and build the best healing team to support you as you get busy living life like you mean it. I hope this interview inspires you to create your own wellness revolution. Whether you have cancer or not, Chris’s remarkable journey and wisdom hold healing gems for all of us. Chris was also one of my amazing guests for the first-ever Healing Cancer World Summit. And while this year’s summit has now concluded, you can join the waitlist to be the first to know about the next summit! You’ll also get a free audio lesson from one of the most popular summit sessions, What You Need to Eat to Beat Cancer with Lizabeth Gold, M.S., R.D.N. 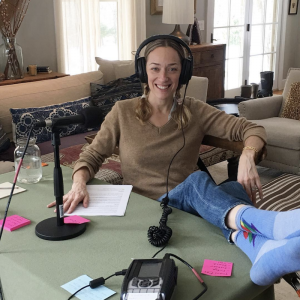 Your turn: What was your biggest takeaway from my interview with Chris? Did you have any a-ha moments? Will you try any of the tips or advice he shared? Hey, this is great information. I signed up for his series that was supposed to start yesterday on the 14th but haven’t gotten any emails about it (checked my spam and trash). Is it a Mercury Retrograde glitch? Kris and Chris – What an awesome interview – Thank You So Much! I found Kris when her documentary was aired on TLC and at that time was a 5 year cancer survivor. I have followed her ever since and have every one of her books. Kris, you are my hero – thank you for all that you do for so many. Chris, your interview with Kris made me cry happy tears. I have signed up for your classes. I had a similar experience as you when I was diagnosed. I tried to find a health food store. It was 1997 – I had to drive 30 miles. I have a rebounder too because Kris said we should bounce every day – and dance – and smile – and be grateful. Yes, Kris is definitely our beacon of HOPE! Thank you so much for your kind words, Vic. I’m glad that the interview resonated with you, and that you’re rebounding up a storm with us! Sending big hugs. Kris and Chris have both been extremely helpful guides in navigating cancer and health! Thanks for sharing your stories with the world. I’m grateful I had/have you to coach me along this long and winding road! This is great! The whole package!!!! I had surgery for colon cancer in May. I was so surprised that they brought me a gigantic piece of lasagna in the hospital right away and there was such little guidance about what I should be eating. I laughed so loud at the “sharp Dorito” comment. I remember avoiding potentially “sharp” foods for a few weeks. Luckily, I have an oncologist and GI doctor that have encouraged a plant-based diet (and they practice what they preach). We are working on an overhaul to diet and lifestyle as a family, eating better and practicing gratitude. This is all the more important to me as I am aware that I may have unknowingly passed high cancer risk on to my young daughters. Kudos to the great work you two are doing. It takes a lot of strength and courage to choose positivity and to give to others! Thank you for sharing your experience, Kirsten. I’m so happy to hear that your docs are working with you on a holistic healing plan. It’s so important! I love that your family is getting involved, too—how wonderful :-). Sending you lots of happy, healthy vibes. xo! Thank you for this interview. Kris Carr you are a REAL pro. I am a survivor of three cancers; colon, breast and pancreatic. I have learned the importance of being your own advocate. It’s become my mission to convey this and Kris you are my mentor. It was outstanding to see both of you together, I’ve watched and read about both of you for years. You both made it real clear that a great life is getting rid of cancer and a great life living with cancer too. I’ve lived with cancer for 10 years and know from experience that we can thrive with or without it. In the future, consider doing events together. I believe there is a strong desire for people to listen to folks that have had and still have cancer. It is tremendously uplifting and a huge service to mankind. I was diagnosed 3 1/2 years ago with an incurable cancer. I had part of my colon removed because of a tumor obstruction and half my liver because of a grapefruit size tumor. Good news is my type of cancer is typically very slow growing but can become aggressive. Felt very alone on my journey until the podcast. Thank You!